Before a new drug can be marketed the Food and Drug Administration must be satisfied that it is safe and effective. According to conventional wisdom, the cost and delay involved in this process diminish the incentives to invest in the development of new drugs. Accordingly, several reforms aimed at restoring such incentives have been implemented and others have been advocated. 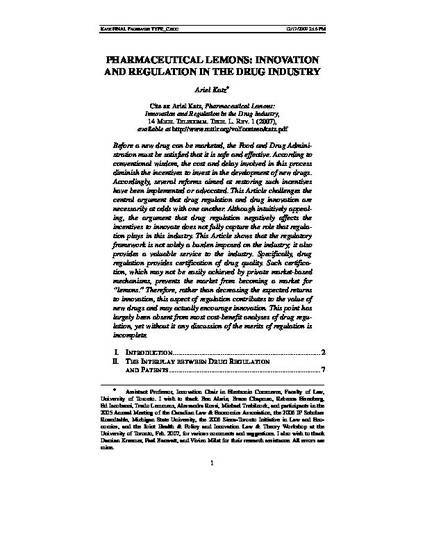 This paper challenges the central argument in the debate on the topic, namely that drug regulation and drug innovation are necessarily at odds with each other. Although intuitively appealing, the argument that drug regulation negatively affects the incentives to innovate does not fully capture the role that regulation plays in this industry. This paper shows that the regulatory framework is not solely a burden imposed on the industry; it also provides a valuable service to the industry. Specifically, drug regulation provides certification of drug quality. Such certification, which may not be easily achieved by private market-based mechanisms, prevents the market from becoming a market for “lemons”. Therefore, rather than decreasing the expected returns to innovation, this aspect of regulation contributes to the value of new drugs and may actually encourage innovation. This point has largely been absent from most cost-benefit analyses of drug regulation, yet without it any discussion of the merits of regulation is incomplete.